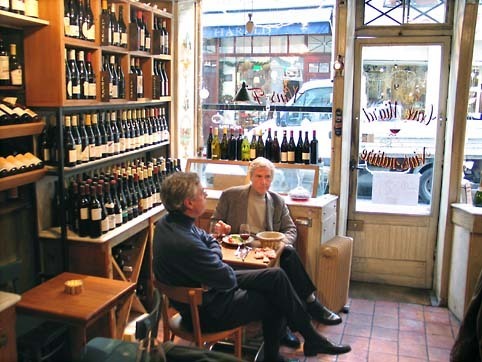 La Cremerie, located on the left bank near Odeon and Bd St Germain in Paris, is at the same time a natural-wine store, a wine bar, and a place where you can eat authentic artisan charcuteries from different regions of France and Spain. The place, which has been run by Pierre Jancou since 2002, is now managed by Serge Mathieu and his wife Helene. The spirit is very similar : Serge serves and sells mostly artisan wines made from organicly-farmed vineyards (90% of the wines here are natural, non-interventionist wines) with samely artisanal charcuterie and cheese imported from Spain, Italy and some french provinces. Born in New York, he lived all his life in France and is an architect by training. He discovered the natural wines, loved them and decided to make a profession of that love. 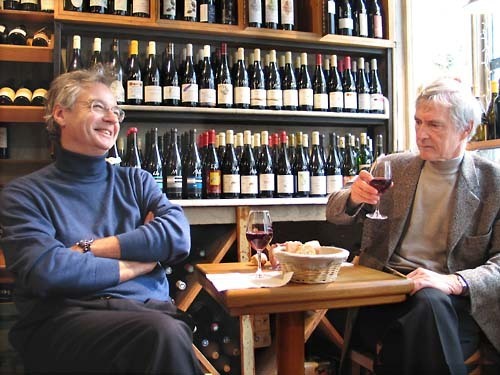 He stayed a while (several months) with Olivier Camus (at le Chapeau Melon, a wine bar in Paris), whom he says is one of the best wine tasters in Paris. Then he discovered by chance La Cremerie, an already-converted former dairy shop located on a side street near Odeon in Paris. Pierre Jancou, who was running the place, was not selling at the time but Serge felt that this was the place. He proposed his help and worked several more months with Pierre to get more experience and expertise. He finally acquired the store in 2006. His wife Helene, also an architect, joined and she helps with the wine as well as with the food. The concept of the place is to be both a wine bar and a wine store. You can walk in, choose a bottle, pay and walk away. You can also drink a glass from the wine-by-the-glass selection, or buy a bottle from the shelves, pay an extra 6 Euro (cork fee) and drink it there. 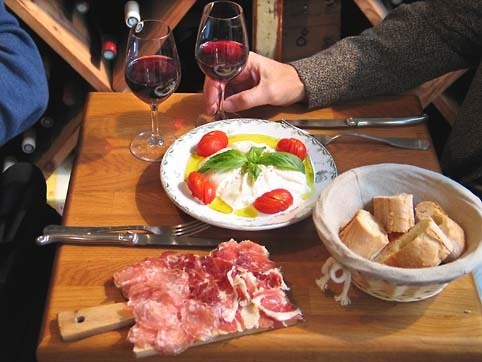 Because of the License, you must order something to eat with the wine, wether cheese or a saucisson plate for example. The wine bar/store/restaurant still retains many of the old dairy shop fixtures, including its beautiful hand-painted tile-ceiling. The dairy shop interior architecture dates from the late 19th century. The venue is not big : enough room for a handful of tables, the counter, and the shelves on both sides, with a large selection of natural wines from all over France, including Bordeaux, which is not so common [pic on right]. 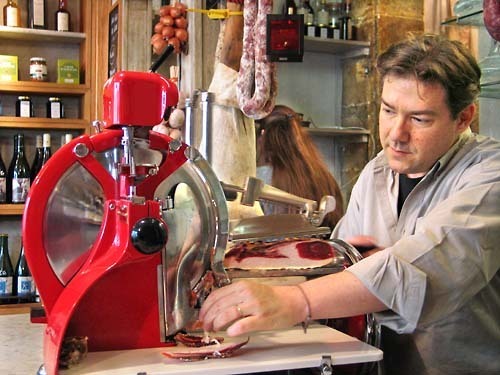 The red-bright ham-slicing machine on the counter is a venerable Berkel made in the year 1936. The Berkel company was at the time based in Rotterdam, Holland. The machine was discontinued in 1955-1960, but there was such a big restorated-machines market in Italy (the country of thin ham-slices, where they sell for about 6500 Euro for a vintage machine from the 20's, 30's or 40's), that Berkel restarted a production line for these very models. 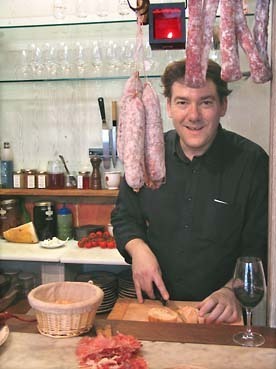 Several Saucissons and Jambons hang over the counter. Saucissons from the Aveyron (from a small place in northern Aveyron named Mur de Barrez), then saucissons from Ardèche, the Lot, all three being french departements well-known for their artisan charcuterie. Also chorizo, and ham from Spain : "Jamon Iberico de Bellota" first, from Salamanca, a high quality ham made from free-range, acorn-fed Iberian pigs. And "Jamon Iberico de Recebo", a lightly lesser ham, from acorn-, pasture- and compound-fed Iberian pigs. Serge says that he is the only one in Paris to have this quality of Bellota. Speaking about the wines he has in the store, he tells me the names that flash through his mind : Pat Desplats ( Domaine des Griottes), Claude Courtois (les Cailloux du Paradis), Antoine Joly (Domaine Roche Bussière and his Gaia), Mas de Gourgonnier (Baux de Provence), Sebastien Riffault and his Sancerre, Mas Foulaquier (pic saint loup), La Treille Muscate (Corbières), Puzelat, Villemade, Marc Pesnot, Tessier, Rivaton, Christian Ducroux (Régnié), Hervé Souhaut (Ardèche/Rhone), Marcel Lapierre, Gramenon, Cornas from Thierry Lallemand, Clos Siguier (Cahors), Jean Michel Schmitt (Domaine Maria Fita). His first price is a Louis Julian at 4 Euro a bottle : a nothing-added (not even SO2) Chardonnay from an organic estate in Languedoc (Table Wine label). He has a few other bottles at about 6 Euro. 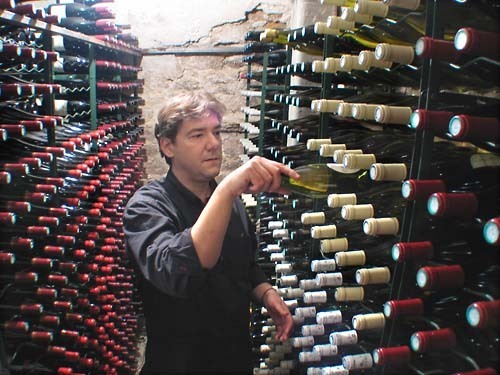 He says that one of his most sought-after wines are the "Pet'Nat wines (petillants naturels), or natural sparkling wines, like "foudre d'Escampette" by Jean Marc Brignot, and Moussaillon from the Domaine des Griottes. He also has some Champagnes, including a few bottles from a very small cuvée of Champagne : from Jérome Prevost, a Sélosse follower, he got 6 bottles from a 1000-bottle cuvée . The two patrons at the table are being served [pic above] a "Burrata di Corato" (a cheese from Puglia, Italy), with unfiltered olive oil from Maussane (near les Baux de Provence). "La nuit aux ailes noires déposa un oeuf né du vent, dans le sein du sombre et profond Erèbe". I actually visited his estate. Michel Augé told me then Erèbe means "chaos and renaissance". Very aromatic wine, with new notes emanating from the glass after 10-15 minutes while we chat. Serge and Helene have four children. I just returned from a week in Paris and was fortunate enough to have taken two meals at La Cremerie. Serge and Helene are delightful people and the food and wine are superb. As a former wine retailer in the US (Astor Wine and Spirits in NYC), I can tell you that choosing the right mix of wines is not as easy it looks. This store/restaurant has a perfect selection. For me, visiting was no great challenge since I was staying at a hotel around the corner (Esprit St. Germain), but visiting La Cremerie is well worth a detour. La Cremerie has become one of our favorite places in Paris. The room is very welcoming as are Serge and Helene. My wife and I spend about three months a year in Paris and stop by La Cremerire several times a month. The food is excellent and Serge is very helpful with the selection of very good and reasonably priced wine. My daughter, a Parisienne, showed us La Cremerie and it is wonderful. Serge makes you feel at home and the wine is superb. Will definitely be back. I lived in Paris as a child, my father was foreign service, and I remember it being a very happy time. Paris is such a wonderful place, and every visit back makes me wish I could live there at least part-time. Thank you for this wonderful blog, keep the great pictures coming. I lived in Paris many years ago and fell in love with everything about it, I have since taken my partner back at least once a year and she has fallen in love with paris & wants to live there. My wife and i visit Paris every September and always visit Serge's great shop. Sometimes for dinner, sometimes for a glass-bottle and a nibble,sometimes for a glass ,nibble and restaurant suggestion! Being in the wine industry myself,his suggestions are always spot on.Serge and his wife both speak English very well.So do not be intimidated of your French is either sketchy or non existant.They will make you welcome either way. La Cremerie was one of my must stops while in Paris due to your suggestion ... it was wonderful . Thanks for the great tip , will be going back every time this Texan hits town . My husband and I visited Le Cremerie recently on a very cold February. We were welcomed on two occasions with wonderful food and wine. Oh, please don't miss the rice pudding. Le Cremerie turned our cold day into a warm experience. We will go back whenever we are in Paris.